The holidays are right around the corner and our clients don’t have ability to buy gifts on their own. We need your help to make Christmas a special time for those we serve! We have approximately 80 children in our foster care program and another 70 residents on our campus. We have two options for you to help make this a wonderful holiday for our children and families. You can donate from our general Wish List below OR contact our Christmas Coordinator to sponsor a child over age 8 or a family living on our campus. 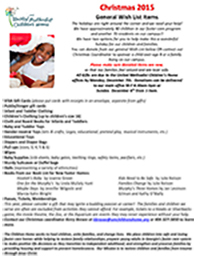 All gifts are due to the United Methodist Children’s Home offices by Monday, Dec. 7. Donations can be delivered to our main office Monday-Friday from 8:30 a.m. – 5 p.m. or Sunday, Dec. 6, from 1-5 p.m. Please only donate new items. This year, please consider a gift that may ignite a budding passion or career! The families and children we serve are often are excluded from activities they cannot afford. For example, tickets to a Hawks or Silverbacks game, the movie theatre, the Zoo, or the Aquarium are events they may never experience without your help. Download the 2015 Christmas Wish List. Contact our Christmas coordinator Kerry Bresee at kbresee@umchildrenshome.org or 404-327-5850 to learn more.